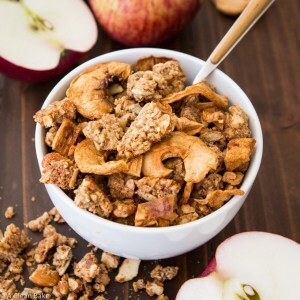 Apple grain free granola is a fall-inspired version of my classic paleo granola (paleola)! 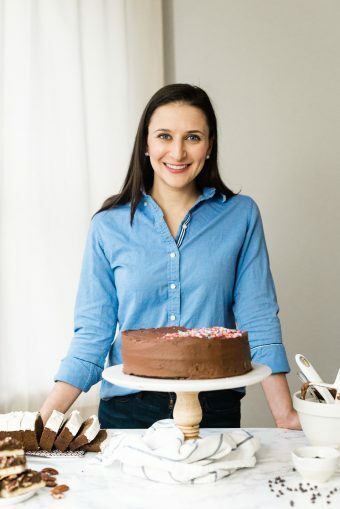 It’s so easy to make, the hardest part is doing the dishes! Hello, and welcome to Inadvertent Apple Pie Week! It was rainy and cold all this weekend. It felt like fall, but the dreary kind of fall that makes you want to eat nothing but apple pie… so, I kind of did. Not just this granola, don’t worry. This isn’t some kind of bait-and-switch where I’m like “There’s Pie!(flavoredgranola)”. And, I swear, this paleola is actually a pretty good substitute for a couple of days. I know, I know, you’re looking at me all shifty eyed because this seems a little far fetched. 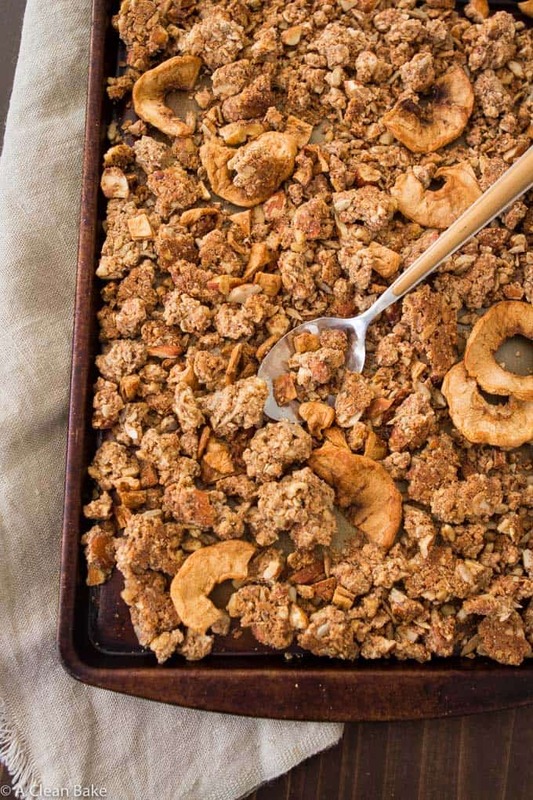 Grain free granola ≠ pie. Ever. It’s math. Yeah, I know math too, and who am I to argue with Plato and all that, but have you tried this stuff? So addictive that I’m supposed to say “and I’m eating a bowl of it right now!” but I can’t because it is long gone and that would be a lie. I’d never lie to you guys (except, conceivably, about the volume of this stuff I eat in a day, but I’m not admitting anything NOTHING TO SEE HERE FOLKS), so I will just say this: Make this apple pie paleola. Almonds, walnuts, sunflower seeds and unsweetened shredded coconut form the base. A pinch of salt and a dash of cinnamon round out the flavor. Almond butter and coconut oil hold it all together. 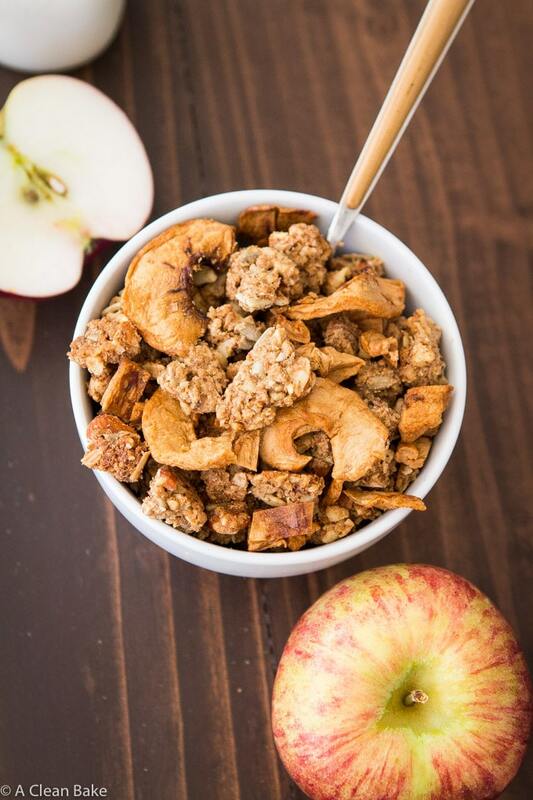 Once it’s baked, you’ll add the key ingredient: dried apples. Their concentrated apple flavor is what really make this apple pie paleola apple-pie-y. 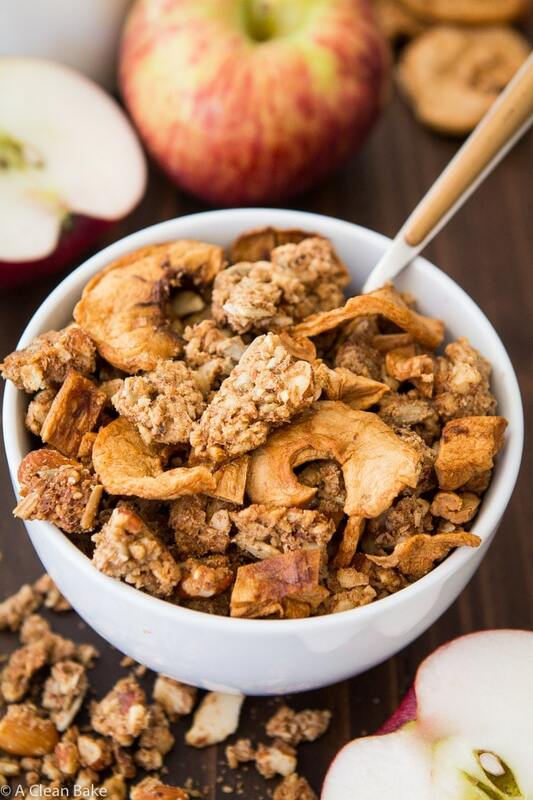 Just make sure you are waiting until the granola is done baking to add them; if you add them early and bake the apples with the granola, you’ll get more of a charcoal-formerly-known-as-apple pie paleola. 😬 Not ideal! Seriously, though, The hardest part about making this is doing the dishes. Well, that and waiting for it to bake, and then cool, so you can eat it. It’s kind of a toss up, but you can let me know what you think when you’re done making it! Preheat the oven to 350°F. Cover a large baking sheet with a nonstick pad or parchment paper and set aside. In the bowl of a food processor fitted with the "s" blade, pulse the nuts and seeds about 10 times until coarsely chopped. Pour the chopped nuts and seeds into a large mixing bowl and toss together with the coconut, cinnamon, and salt. In a small bowl, stir together the almond butter, maple syrup, and coconut oil until combined. Add the wet (almond butter) mixture to the dry (nuts and seeds) mixture and stir until well combined. Turn the mixture out onto the prepared baking sheet and press firmly into an even layer about 1" thick. It does not have to cover the whole pan. Bake for 20-25 minutes until the top is slightly crisp. Remove from oven and cool completely on the pan before using your finger tips to crumble into large or small clusters. Sprinkle the apples over the top of the clusters. Once fully cooled, transfer the paleola to an airtight container. Warm your nut butter slightly (20-30 seconds in the microwave) to make it easier to stir, if necessary. Yield: Approximately 6 cups. One serving = 1/3 cup.